1977 Vintage Simplicity sewing pattern # 8311. Misses vintage size 14. Dress or top and skirt in two lengths. 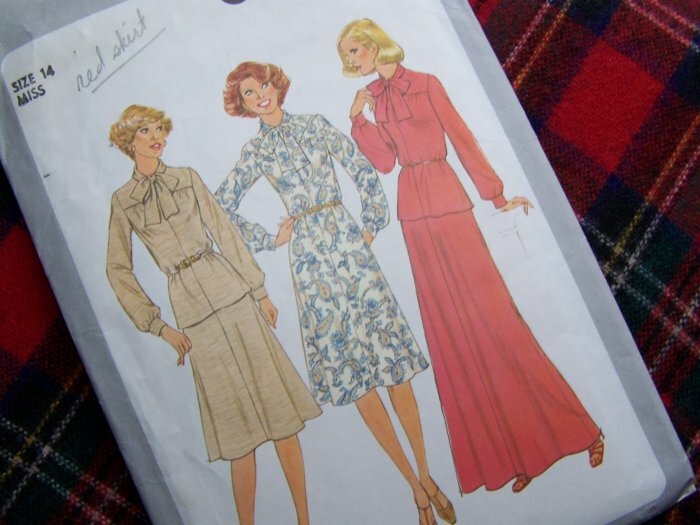 More new and vintage sewing patterns listed. ~*~ Some envelopes have writing, age spots or tears, cut pattern pieces may have pin holes, tracing wheel lines, notes, wrinkled piece. Measurements: Bust 36". Waist 28". Hip 9" below waist 38". Suggested fabrics: Cotton types: Challis - broadcloth - plisse. Linen types. Silk types: crepe - pongee - shantung - crepe de chine. Lt wt wool types: jersey - flannel - lt wt knits. S & H to USA is 1 penny shipping special! S & H to Canada is $3.25. International: Paypal only. Please ask for your countries shipping price. I have over 12,000 new and vintage sewing, knitting, crocheting, cross stitch and plastic canvas patterns in stock!